Jayashree R Patnekar was initiated into Hindustani classical music by late Shri Vithalrao Pai at Sawantwadi. When she was 16 she began learning under Pandit K D Javkar of Kirana gharana at Mumbai. 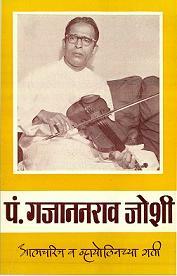 However, it was under Pandit Gajananrao Joshi (violinist and vocalist) that she matured as a vocalist. She also tool training under Pandit Nivruttibua Sarnaik and Pandit Ratnakar Pai of Jaipur gharana. In 1962-63, she stood first in the classical music competitions organised by AIR Bombay and the following year she stood second in the competition organised by AIR Delhi. Awarded prizes by several other prestigious organizations like the Vile Parle Music Circle, Sursingar Samsad, Indian Culture League and others, she was also awarded the 'Surmani' at Kal-Ke-Kalakar Sammelan in Mumbai (1972). A regular artiste of All India Radio, she has performed for AIR Mumbai and from 1977 onwards from AIR Dharwad. Recognized as an `A` Grade artiste in 1983, she has performed for National Programmes as well as Tuesday Night Concerts. A regular concert performer, she has participated in music conferences in the major cities of India as well as the NCPA, Dadar-Matunga Music Circle, Sawai Gandharva Music Festival, Pune (1993), Gwalior Sangeet Sammelan, Gwalior, Basant Sangeet Sammelan, Delhi and the AIR Sangeet Sammelan, Lucknow (2000). In 2005 the Govt of Karnataka honoured her with the Dr. Mallikarjun Mansoor Puraskar.